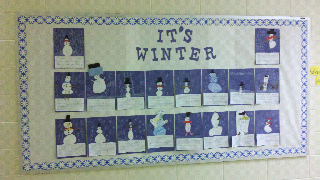 The Grade Three Jamboree: 1st Bulletin Board: "It's Winter!" Here's a picture of the bulletin board I created, along with my teacher. The kids were able to write what they liked about winter, and then created a snowman picture to go along with it! I thought it turned out great!